Our 2017 Road Trip, Part 41: A Meeting on Mount Washington « Midlife Crisis Crossover! 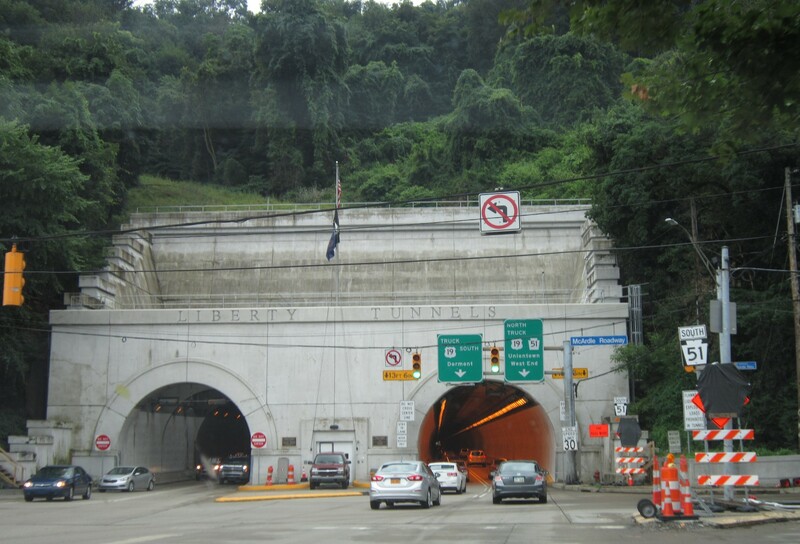 For a second I was excited that we might get to zoom through more mountain tunnels, but Google Maps insisted we make a hard right at the street sign. Rats. 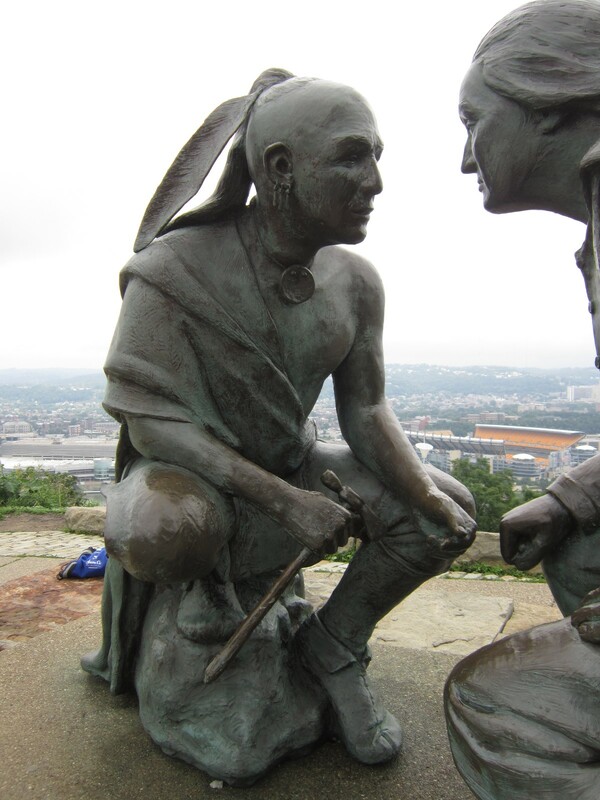 In 2006 the bronze sculpture “Points of View” was installed in front of the fabulous Pittsburgh panorama. The work of artist James A. 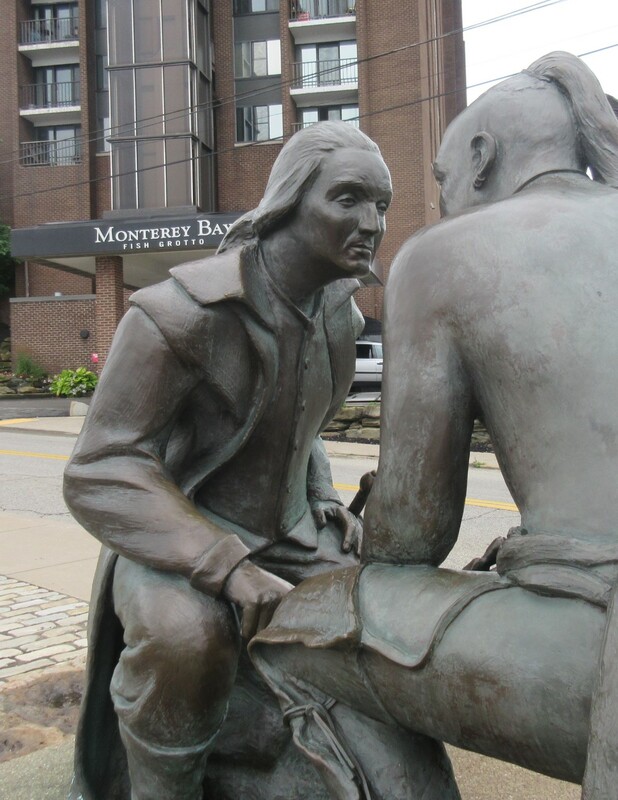 West, it depicts a 1770 meeting between future American President George Washington and Guyasuta, a leader of the Seneca tribes, who were there first. 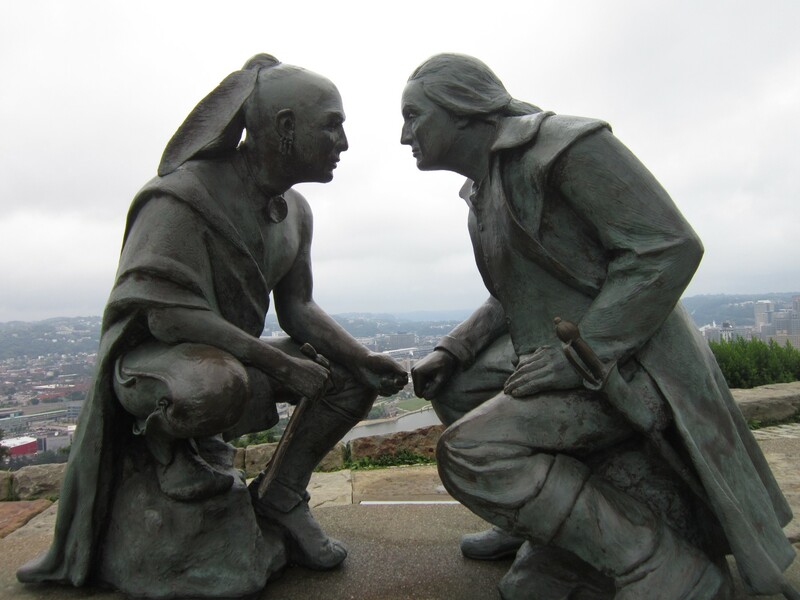 The two had met previously in 1753, shortly before the French & Indian War, but reunited to discuss their ideas for the future of the area. The reunion ended amicably and without immediate bloodshed, for what it’s worth. Sources indicate the actual confab took place nearby down below, but Mount Washington has a much showier view. Our lead photo puts the city in the background. Swing around to the other side, and now they’re chatting in front of a working-class neighborhood. 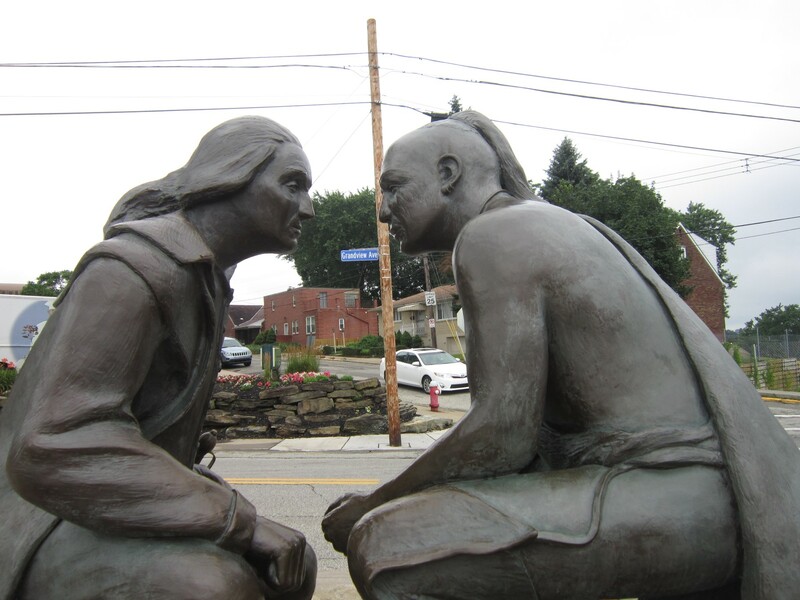 In this corner, Guyasuta of the Iroquoian Seneca, local guide who largely sided with his people and not exactly with us in either the French & Indian War or the American Revolution. In thee other corner, this guy George Washington, beloved idol of millions and so on. And behind them…that view. 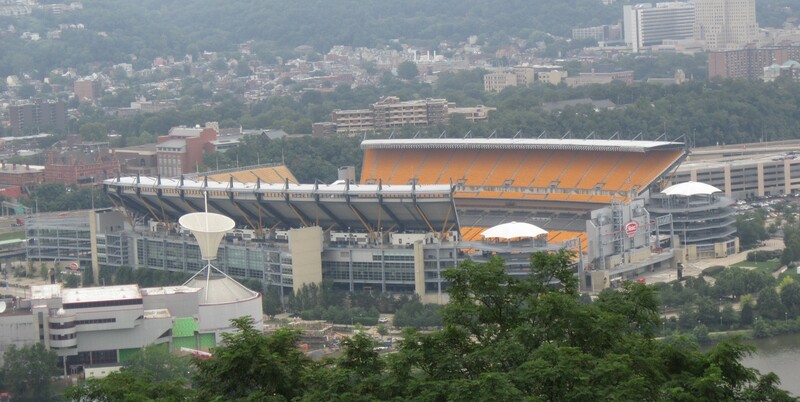 All the better Pittsburgh travel materials use photos taken from Mount Washington. If only every major American city had a natural vantage to let photographers capture their good sides. To the northwest, the Ohio River heads toward our home and eventually forms Indiana’s southern border. To the north, the Ohio River comes to its easternmost end. Up and to the right, that’s the Allegheny River rushing in to meet it. To the east, downtown skyscrapers dominate the skyline. At far right is the third of Pittsburgh’s “Three Rivers” — the Monongahela, which we previously visited on Day Two down in West Virginia, and coincidentally was an answer on Jeopardy! this past Thursday night.